CyberConnect2, better known for their Naruto Ultimate Ninja Series is celebrating their 23rd Anniversary. In their midst of celebration, CyberConnect2 CEO, Hiroshi Matsuyama, detailed their plans for the next decade. A 20-year anniversary title of Little Tail Bronx! 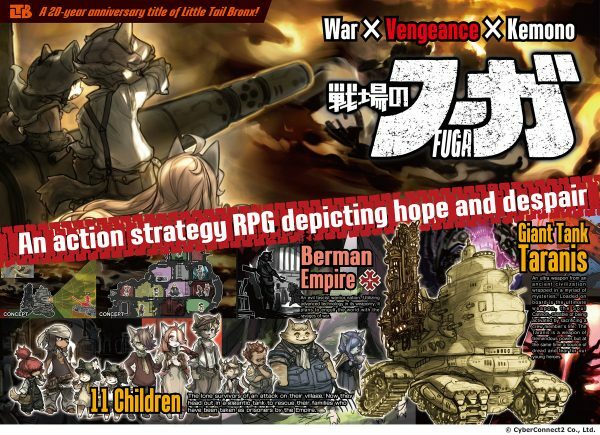 An action strategy RPG depicting hope and despair. Berman Empire – An evil fascist warrior nation. Utilizing advanced technology in its weaponry, it plans to engulf the world with the ravages of war. 11 Children – The lone survivors of an attack on their village. Now they head out in a gigantic tank to rescue their families who have been taken as prisoners by the Empire. Giant Tank Taranis – An ultra weapon from an ancient civilization wrapped in a myriad of mysteries. Loaded on board is the ultimate weapon, the Soul Cannon, capable of being activated by sacrificing a crew member’s life. Taranis is a weapon of tremendous power, but at the same time a source of dread and fear for our young heroes. Cut down evil in the ogre capital. High speed parkour style slashing action! Heroine: Towako Mutsu – Losing her friends and suffering a deadly wound from the Kubizuka incident, Towako narrowly escapes death by transplanting a heart created by unknown technology known as the Ogre Engine. Towako now sets out on her quest and vows to take revenge against Genshu Kubizuka. Nemesis: Genshu Kubizuka – The man who betrayed Japan and the nemesis who rose in revolt against the world. Summoning Ogre Gates which connect this world to hell, he intends to obtain a fantastic and sinister power, Hakumen Konmo, exceeding that of nuclear weaponry. The Battle Takes Stage in Tokyo! – Due to the plot of Kubizuka, Ogre Gates appear one after another in the imperial capital Tokyo, transforming it into a city swarmed by a hideous evil. 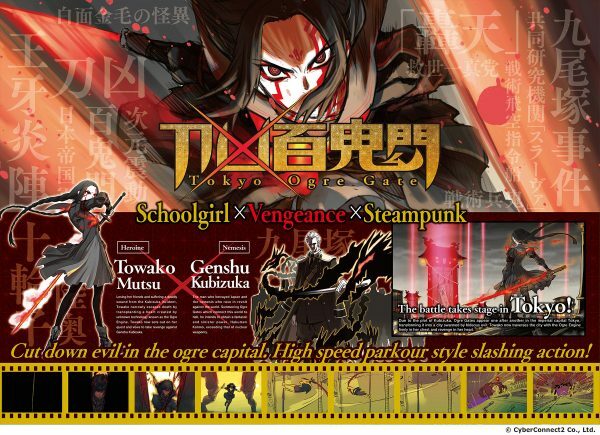 Towako now traverses the city with the Ogre Engine firmly in her chest and revenge in her heart. An exciting new tale depicting a crazy world, the scramble for the witches’ hearts! 2.5D side scrolling ultra fun witch action! One night, when the moon is full, four sisters enjoying a carefree life are summoned to an old castle by their mother. Wiating for them is a “ceremony” which will turn them into witches. Due to the ulterior motives of their mother, the four sisters are stripped of what they cherish most. Heroine and Fourth-Born: Cecile – Now mute, she heads fiercely towards her mother to enact her revenge having had her beloved singing voice snatched away. Third-Born: Carla With the loss of her feminine and voluptuous adult body, she is doomed to live for eternity as a child who will never mature. Second-Born: Rezalia – Her love was dance, but her mesmerizingly masterful and prodigious gifts were stolen from her, when both of her legs were claimed. First-Born: Aristel – Losing her beloved husband, the king, her eternal life is doomed to that of a sinner. Transform your umbrella into all kinds of shapes and unleash hell on your enemies! Bathe in elegant free flowing slashing action as you use your sword infused umbrella and magical powered weapons! Experience the dual-weapon mode using your sword and umbrella! Dice your enemies and bring about certain death with your overwhelming speed! Invoke special actions utilizing a variety of shape transformations with your umbrella! 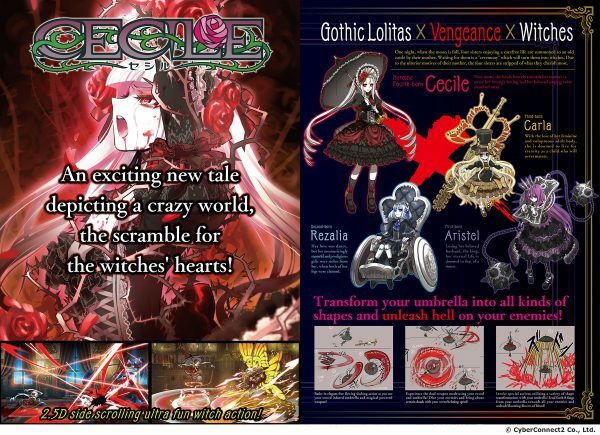 Send forth 8 fangs from your umbrella towards all your enemies and unleash blooming flowers of blood! While no release dates were given, we do know that all three of the games will be coming to the Nintendo Switch at some point. The studio has also announced an original anime project and recruitment programs, more details of which can be found here.